Spring is here, and the weather is perfect for outdoor dining. Lidia has selected these recipes for a relaxing meal on a warm evening - try it paired with a nice pinot grigio or lemon seltzer! Primavera means springtime, but you probably have most of the ingredients in your pantry all year. This recipe lists the vegetables I prefer, but don’t be afraid to use others, if that’s what you have on hand. Everybody is familiar with string beans dressed with butter, but the addition of one herb, mint, re-creates the dish so it has a new and fresh taste. Mint can also be added to zucchini, peas, cauliflower and other favorite vegetables. One of the best things about tiramisù is its versatility: the conventional version calls for espresso, but other flavors can be incorporated into the dessert with great success. 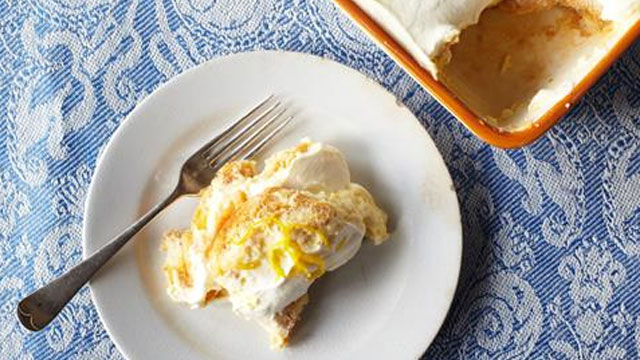 Here the brightness of fresh lemons and limoncello lace the cream and soaking syrup, resulting in a tiramisù that is refreshing and irresistible.